St. Ann’s Church and Shrine, at the corner of Broadway and Emslie streets, is the largest vacant religious structure in Buffalo. It was built between 1878 and 1886 by its own parishioners—skilled German artisans lacking in worldly wealth. Every stone was quarried, cut, and fitted into place by the church’s flock. 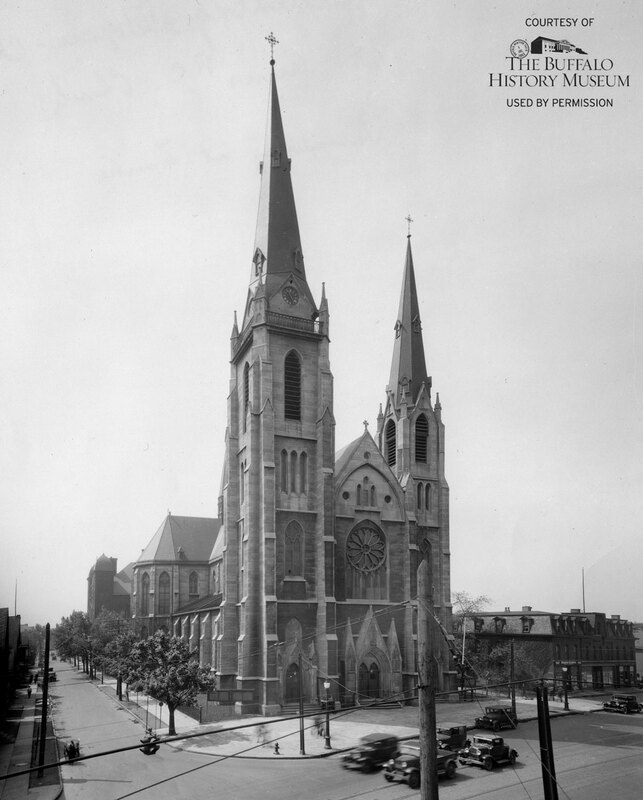 Two spires, 225 and 180 feet in height, extended from the east and west towers prior to their removal in 1964. Of the six bells in the east tower, one—named Sancta Anna—weighs 7,800 pounds and is reportedly the largest swinging bell in Buffalo. A mechanical weight and pendulum-driven tower clock, added in 1895, is still operational. The Royal Bavarian Art Works in Munich created the 35 stained glass windows. The church and shrine is even home to three “sacred particles” which some believe are from the body of St. Ann, grandmother of Jesus. Today, the church’s future is in doubt. The census tract surrounding St. Ann’s lost 77 percent of its population from 1950 to 2010. The Buffalo Diocese closed the church in 2012, and announced plans for demolition in 2013. It was shortly declared a city landmark and a Vatican court, acting on appeal by the small flock fighting for the church, ruled in 2014 that St. Ann’s could not be deconsecrated. St. Ann’s Church and Shrine is now in limbo. Needed repairs are not being made, and demolition by neglect continues.